Ordered €500 online to be picked up at local store. Money deducted straight away. By next day still no email confirmation, needed to not only confirm but pick up order. Spent ages trying get through automated customer service. Finally spoke to somebody who said no record of me or my order. And to contact head office via email. Did immediately got automated response till next day then only will pass message on reply. Forget it. Got on to my bank had transaction stopped/returned. Took another hour of my time as of course lot of procedure. Another day later lo and behold got email from Debenhams saying found order and to pick up. Replied that I have had it cancelled. Never again. Whilst iorder may have eventually been found and processed, in this day and age with scams was too much of a risk waiting around believing no trace before reporting to bank. Good Got my Euros within 24 hours. NEVER AGAIN! Ordered £500 worth of Euros online - got a confirmation email and money was taken straight away. Went in to collect my money the next day and was told they'd run out of Euro and shouldn't have taken my money. 19 days and many frantic phonecalls later I finally got my refund - a far cry from the "10 working days" I was promised when they shouldn't have taken my money in the first place!! Down £1000 and I had to go somewhere else to get my Euro for my holiday - would never use them again and I'd urge anyone else against it too. Worst customer service I've ever received! Have used many times over the years , just gone in store never pre orders always got amount of Euros required at rate on line also £5 voucher off of £20 spend on same day ,don't go anywhere else ,never had a problem at the Chelmsford branch. Great service, best rate on the high street for euros and they give you a five pound off voucher on a £20 purchase in store. You are also told about an offer they run which gives you an additional 20% on any left over euros that you load on to a gift card. Have used their service before. Have had no trouble ordering my currency on-line nor getting it delivered on time. Sensible denomination of notes sent and very competitive rates. If I could score minus I would!! I can honestly say this is the worst service I have ever received!! I ordered my currency to be delivered, there was a glitch in the system and some how the top line of my address was missing therefore the money could not be delivered! I called to discuss the issue and was told that my money would be refunded within 48 hours as this was a problem with the Debenhams system and that my issue had been escalated I have either rang or emailed customer service almost every day since ( including whilst on holiday) to try to get my money refunded! I am still waiting for the refund 2 weeks later! The customer service has been absolutely terrible and I have never received such bad service! I will never use Debenhams again and I wanted to warn people of the terrible service they provide! In my opinion this is not a service Debenhams should be providing as they cannot satisfy customer requirements! I advise that you steer clear and use another provider! If there was a zero or minus star option I’d select one of those... I ordered euros on Thursday. An email arrived saying collect ANYTIME on Friday. I arrive at 12:30 on Friday to pick up money to be told it hasn’t arrived and is delayed. Lady behind the counter tells me the email says collect after 2pm. I say the email says collect Euros anytime on the day of collection. The email also says collect after 2pm for ALL OTHER currencies. I phone the customer care team (?0333 003 7071?) and after 15 mins they say they will transfer me to the store to check where my Euros are and when I can expect to collect them but the call fails and line goes dead. Nobody calls me back. I get a bus back to the store at 4pm wait 15mins to get served, one person on money and 5 people in the queue, I ask other store staff if there’s anyone who can help out, there isn’t. No apology for the wait. I had to get two buses and walk back to my car to get home and reschedule all my evening plans. Worst start to a holiday ever!!! 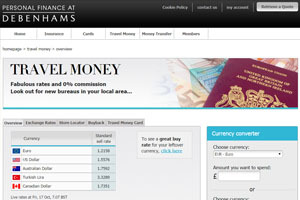 I’d rather pay a higher exchange rathe than us Debenhams travel money online or in store service again. ordered online and collected from Kiosk next day, got the best exchange rate and a voucher to spend in store. Ordered online, easy process and absolutely no hassle. Arrived next day as promised. Unsure why some people are moaning about rates it's always different on line than in store. If you show them the site and current rate at the bureau they will always match it. As for charges from bank always pay on debit which avoids hefty cash advance fees on credit cards. Best rate available at the time of ordering, received the very next day as promised and very simple and straightforward to order, took a maximum of 2mins (no idea how some find this problematic?). Everything worked perfect. Received money the next day at 11 am. Said I didnt even have an order when I ordered online. When I arrived they didnt have the currency I needed. What a complete waste of time!!! Worst experience ever chelmsford branch. Rate not same as advertised. Didn't get the notes i want. Duty manager poor handling customer care. Never buy from debenhams, scam to trick customers. I found ordering on line very difficult but on the 4th time of trying I managed to get my order excepted. However, by this time the rounding-up of the requested £500 had suddenly changed to rounding- down which of course took the total a fraction below £500 and thus I was charged £6.95 fee. When I complained I was informed that it was not in fact Debenhams I was dealing with but a faceless bank. I travel a lot and always worry about the rounding -up of rates never down. I will not be caught again by Debenhams. YOU DONT GET A £5 VOUCHER IF YOU ORDER ONLINE AND HAVE YOUR MONEY DELIVERED TO YOU. Very let down by this old fashioned sneaky small print trick from Debenhams. I was one of their credit card/account holders but will review after this experience. Lovely colour ad on the front page of travel money saying free £5 off £20 spend. This tipped the balance for me to order. After phoning to complain when no voucher was included with the money I was told about the small print. More fool me. Don't treat us like this Debenhams. It's underhand. If it was a transparent policy it should be up as a rider right next to the "free" offer. No wonder you're losing customers. Absolutely brilliant couldn’t have been easier I bought some aus dollars, the girl was so helpful , I would use them again and again,no problems excellent. FREE £5 off £20 spend voucher in store plus preferential rates for Debenhams Cardholders. Extra 20% free when you load your leftover currency onto a Debenhams Giftcard. Collect your currency from over 100 stores nationwide, or have it delivered to your door.